FP2020 countries have high levels of unmet need, with more than 140 million married women estimated to have had an unmet need for family planning in 2012. These are married women who are not currently using family planning but who have expressed that either they do not wish to have additional children or they wish to wait at least two years before having a child. While there are different methodologies used to produce estimates of unmet need, this number is derived from the UN Population Division’s methodology because it produces country-specific estimates as opposed to regional estimates. 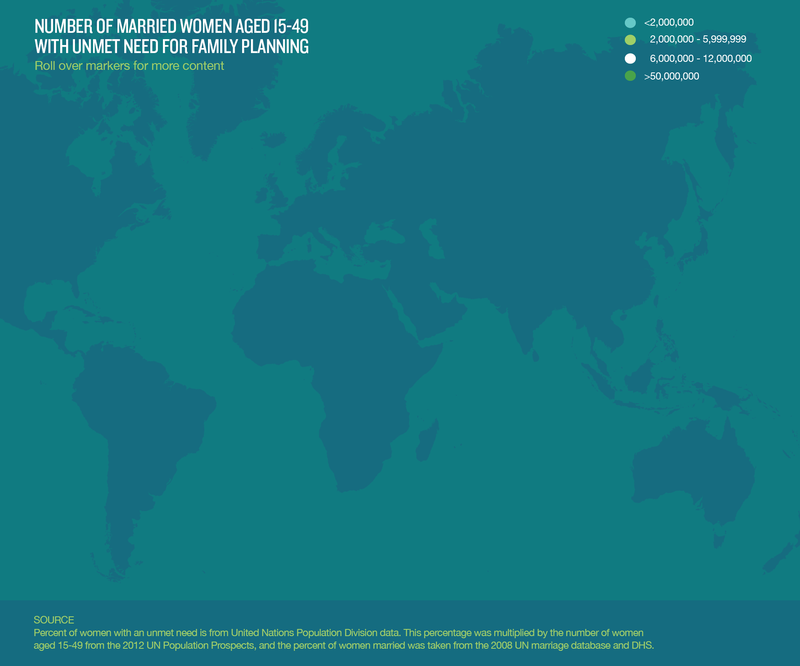 The interactive chart below shows the number of women with an unmet need in 67 of the 69 FP2020 countries (South Sudan and Western Sahara are omitted due to lack of data). It should be noted that the FP2020 pledge to reach 120 million additional women with modern methods also aims to increase access among these 140 million women, as well as among unmarried women with an unmet need and women currently using traditional methods who may want to change to a modern form of contraception. Calculated from United Nations Population Division Data on Unmet Need among Married Women and Married Women of Reproductive Age, 15-49.